Beginner lessons are a top priority at Cessna Stables. Building a strong foundation from the start will help to eliminate wasted time later! All too often, experienced riders come to us wondering why they are unable to move forward and the problem is incorrect basics. All beginner lessons at Cessna Stables are private. We do not believe it is in the beginner's best interest to start in a group lesson format. The beginner's first job is to learn how to control and position her body on the moving horse. In a group, the rider must simultaneously control the horse. That is asking a lot from most beginners. It is also asking a lot of the horse. A new rider who can barely control her body is not going to give very clear direction to her horse. In a private lesson, work can begin with the horse under the instructor's control, either in-hand or on the lunge. For this reason, we offer the New Rider Package - a discounted package of private lessons, to give the new rider the best chance for success! 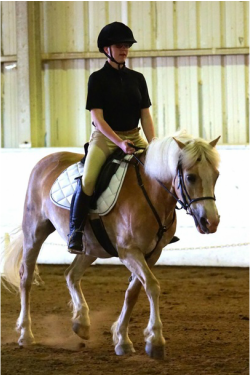 In addition to position and body control, beginner lessons include many aspects of basic horsemanship including grooming, tacking, horse handling, and safety. We put a strong emphasis on safety at Cessna Stables. Many riders are overfaced early on in their riding career, leading to fear, frustration, and disappointment. An appropriate mount is essential to success! Our school horses have been chosen to help riders at each stage of the learning process gain confidence and master challenges appropriate to their skill level. Currently, we are accepting riders ages 10 & up to our beginner lesson program! The majority of our students at Cessna Stables are adults. We are well versed in the needs of the adult beginner and the female rider. Ladies over 35 are currently the fastest growing group of equestrians, and we think thats fantastic! Many ladies who begin with us worry that they will be the only "grown-up" in a group of kids! Don't worry, you will find a large group of like-minded adults here! Adult riders have different needs and interests. Adults often have more fears to contend with than young riders. They also are typically far more interested in gaining as much knowledge and understanding as they can about the whys and hows of horses and riding. They sometimes need more time to gain body awareness and control. Thankfully, they often have more time and resources to devote to their passion. We would be happy to help you realize a life long dream! To schedule a half-price trial lesson, please call 330-461-2318 or write cessnastables@yahoo.com!